Todays app of the day is DataMan Next. Created by Johnny Ixe, DataMan is one of those simple and straight forward apps, which does exactly what it says on the tin. What problem does DataMan solve? 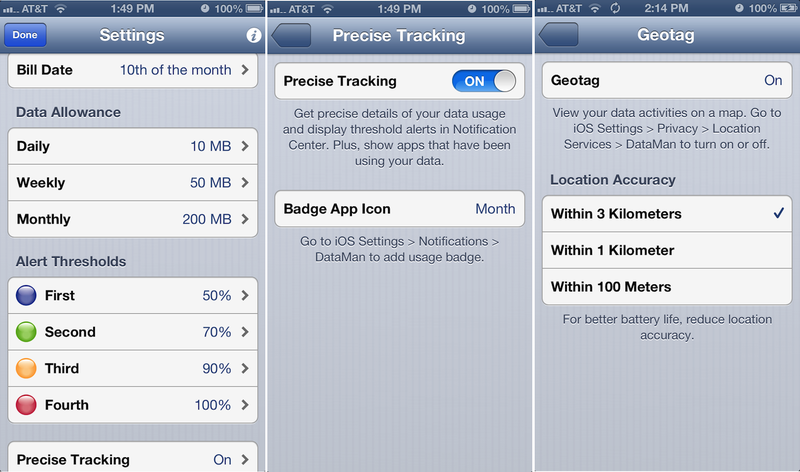 The purpose of this app is to track the amount of data that you have been consuming on your mobile device. In the age of 4G connectivity, and super-potent and involved apps, the amount of data that we’re collectively chewing through is rising exponentially. The trouble with most smart phones, and indeed smart phone plans, is that it is nearly impossible to track how much data we are using. Take the example of somebody travelling abroad, where data roaming costs are notoriously high. We’re now bang in the middle of holiday season, and this will become pertinent to many BurnTech readers. How much data will i use if i flick my roaming data on for 5 minutes? How much data does the average email use up? How much data does Google maps use? All of these are questions which DataMan can help us to answer. Whilst much of what this app does is highly self-explanatory, some of its features are a little more noteworthy. The first and most core feature is the data consumption tracking. You set the app up and can then easily monitor, with granular breakdowns, how much data you are using. Monitoring the data usage is one thing, but making the data actionable is always key. Dataman achieves that by allowing you to set up easily configurable threshold alerts. Therefore, you can set your own boundaries of data usage with this app, or maybe even more usefully for many, you can set the data boundaries for your children. This app thus has the potential to lower the risk of your kids going crazy downloading extras within app games, which is a growing concern for many parents. Our very most favourite feature though is the Dataman forecasting tool. This tool machine learns your patterns of data usage, seemingly both over shorter periods of time and longer durations. It is therefore able to pick up on short-term changes in your usage, such as a vacation or business trip abroad, and is still able to predict whether you will stay within your data limits. The apps interface is very simple and to the point. Logon, and it will show you the amount of your data thaT you have used, presented as a simple percentage. It will also show you how many days are left in the current billing cycle, thus displaying something like ‘13% used, 9 days remaining’. Alongside this, you get shown your current data connection and the strength of your Wi-Fi signal.